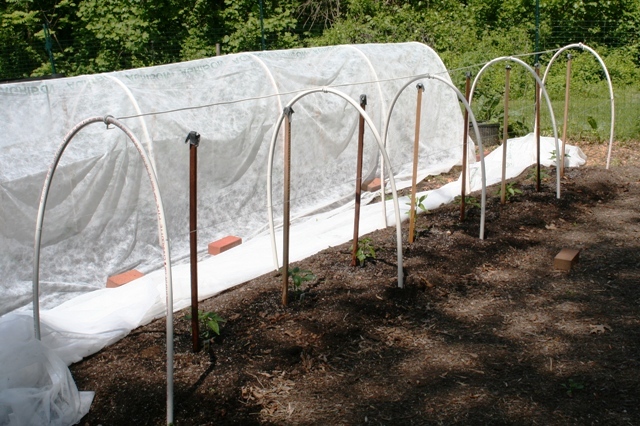 Want to know how to use floating row cover in your garden to protect against brown marmorated stink bugs and other pests? Check out our new informational page at the Grow It Eat It website. See descriptions of structures you can build to hold up the row cover over different-sized plants (it can also lie directly on top of some crops) and read lists of plants that don’t require insect pollination, so you can leave the cover on all season, as well as those from which you have to remove the cover. Check it out! ← They’re back: Popillia japonica! The temperatures under the row covers at the HGIC demo garden are somewhat higher than on the outside. However, tomato fruits are set and developing and no premature flower drop has been observed.